Wondering where to take your G-Wiz car or Vectrix scooter for a spin? How about Croydon? After enjoying a wonderful morning's shopping at its historic Whitgift Centre, you could join the happy throng at Ikea for some MDF purchasing before browsing more chain stores on the High Street. But before you leave, don't forget to pop over to Comet on the exciting retail arterial of Purley Way for a free top-up of electricity. Comet today announced that it is the first retailer to offer free charging of electric vehicles via Plug & Go points, in its Croydon store car park. Hugh Harvey, Comet 's MD says: "As an electrical specialist we need to respond to customer demand and with electric vehicles set to revolutionise city living over the next few years, it is only right that we look to sell them as part of our offer." Using the service sounds fairly straightforward. A key to unlock the point can be requested by emailing charging@comet.co.uk or by asking at the Customer Help Desk in the Croydon store. The power lead is plugged into the vehicle and into the Plug & Go socket, where it's locked until charging is finished. Plug & Go provides 240 volts AC at 13 amps (but no sneaking your iPhone on there now). The service will be available from 9am–9pm Monday-Friday, 9am-7pm Saturdays and 11am–5pm on Sundays. 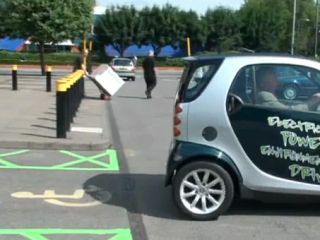 Check out a video of the process here www.youtube.com/watch?v=gh-B3nzVwVg - which also shows the Plug & Go points situated naughtily in the disabled parking bays. Should the initiative prove successful (ie. not vandalised by hoodies or wheelchair users within 10 minutes of being installed) the service will be rolled out across Comet stores nationwide.